At the Frankfurt International Motor Show, CITROËN will premier a concept car inspired by the iconic 1960s Citroen Méhari: the CITROËN CACTUS M. An ‘outdoor’ take on the C4 Cactus, this new concept car has a bright, upbeat personality. Looking beyond design, CITROËN is expressing a lifestyle approach with the CACTUS M, placing leisure at the heart of the automotive experience. At ease on all types of terrain and in all situations, the CACTUS M concept inspires a sense of well-being, freedom and escape. An open-air crossover. 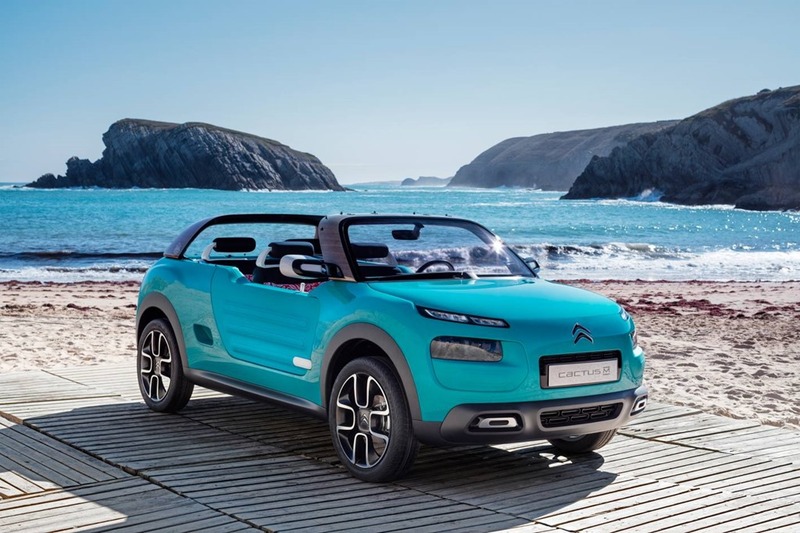 Further developing the approach suggested by the CITROËN C4 Cactus, the CACTUS M has ‘go-anywhere’ looks, clearly stating its family ties with the CITROËN Aircross concept presented in Shanghai last April. The wings are sculpted around the wheels for a more compact, muscular look. The straighter windscreen, raised body and wheel diameter underline its personality as a leisure vehicle. On the body sides, the large plastic doors add a lightweight, protective touch, giving the vehicle its signature. This design brings to mind the renowned Méhari, a vehicle with the same ‘go-anywhere’ mindset. The cabin is completely open. Passengers access the seats in row 2 by climbing over the body side, using an insert provided at the rear for support. Nothing separates the passengers from their surrounding environment. Ingenious and with a strong leisure focus. Through its design, the CITROËN CACTUS M turns leisure into a lifestyle, placing it at the heart of the automotive experience. The interior illustrates this approach, with technical materials used in open-air activities. For full and uncompromising use, the cabin can be hosed out thanks to the drainage outlets integrated in the foot wells. Inspired by the world of surfing, the seats are designed to resemble wetsuits, and are upholstered in a brightly coloured neoprene fabric for comfort and waterproofing. 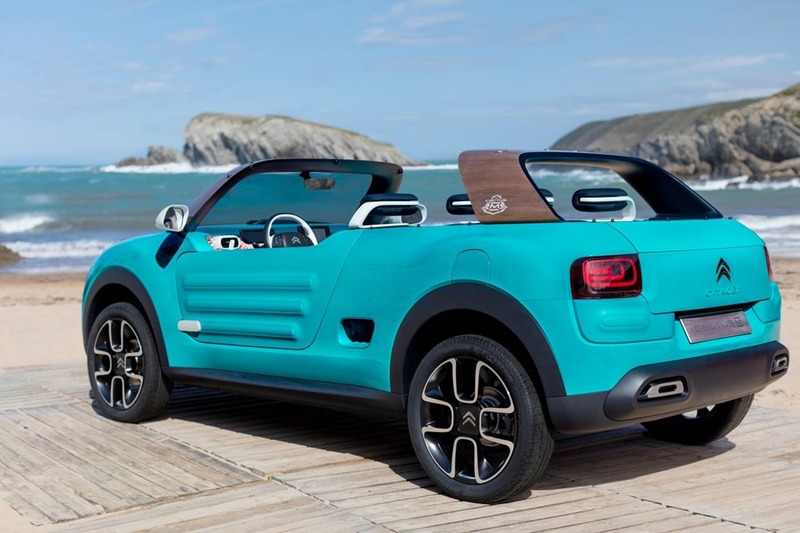 The CITROËN CACTUS M is also a modular vehicle, with a roof extension that enables passengers to store all their equipment (wakeboard, windsurf board, etc.). Everything is designed for comfort and peace of mind. At ease on all types of terrain. The CITROËN CACTUS M was also designed to head off the beaten path, to explore and open up new horizons. Whatever the activity, the weather or the road conditions, everything is designed to ensure a relaxing ride for the occupants. On all types of terrain, the Grip Control function optimises traction for a relaxed ride anywhere. The CACTUS M also inspires a sense of extreme freedom with a modular cabin that turns into a couchette and a top that can be made into a tent. This top, which features an innovative system of inflation, also provides protection in the event of rain. The CITROËN CACTUS M also features onboard technologies for everyday use with all the useful equipment found on the C4 Cactus (touch drive interface, Easy Push system, etc.). The CACTUS M concept is a modern take on the values that led to the development of the Méhari. Values relating to comfort, well-being and leisure, which have always been part of CITROËN. DIsplayed alongside the C4 Cactus and the Aircross concept, the CACTUS M concept illustrates the vitality of the brand and the coherence of its approach. One year on from launch, CITROËN is displaying a new take on the C4 Cactus at the Frankfurt International Motor Show, with a concept of muscular lines, totally open to the outside world. The SUV looks of the CACTUS M, already suggested by the C4 Cactus, are underlined by its styling and specific features. At front and rear, the strong, sculpted side lines convey a sense of power. The use of Tall & Narrow tyres made it possible to increase wheel diameter while reducing width, thus increasing body height. This impression is reinforced by the specific wheel arches. The strong compact build of the CACTUS M is underlined by the 60° rake of the windscreen and the thickness of the pillar, which conveys a sense of strength. The design of the lower front and rear bumpers and door mirrors was inspired by the CITROËN Aircross concept. 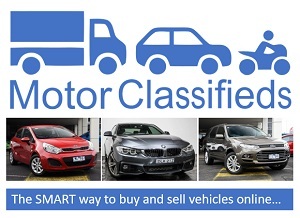 The solid metal tow hooks and door mirrors convey a sense of protection and quality. These styling attributes position the CITROËN CACTUS M in the world of SUVs and reflect the ties between the two concepts. Like the Méhari in its time, the CACTUS M concept was designed as an open-air vehicle. It seeks in every way to bring passengers closer to their surrounding environment and to make life easier. The CITROËN CACTUS M has two long doors, further underlining the impression of compact lines. The design of these one-piece parts in moulded plastic makes them particularly easy to use while also reducing overall vehicle weight. These doors are designed like Airbump® and use the same concept with their thermoformed TPU coating. 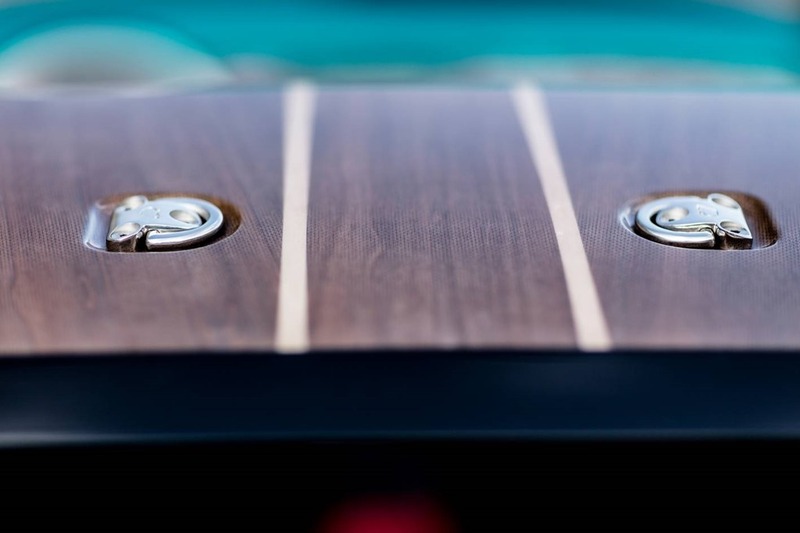 This second skin, which is also used on the bumper protection, resists knocks and scratches as well as salt water, sand and anything else that could create a barrier between leisure and mobility. The opening panels are designed with visible hinges just like the renowned Méhari, which also had ABS plastic bodywork. 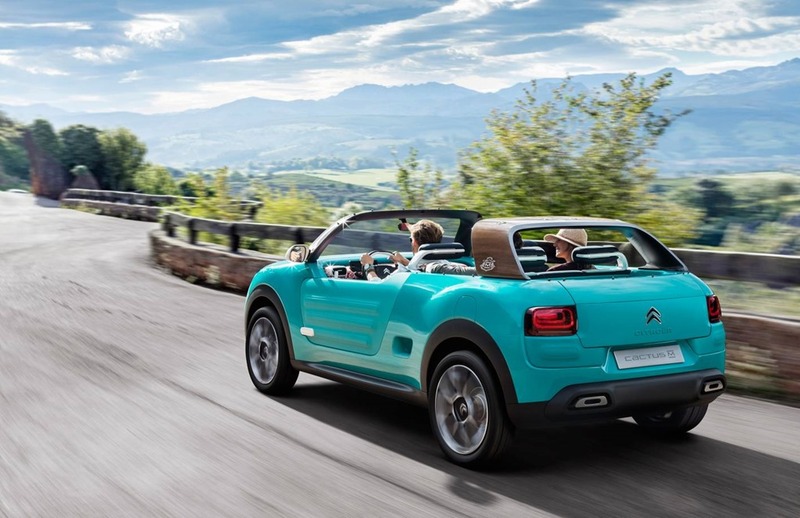 Inspired by the surfing spirit, the CITROËN CACTUS M has no roof or front pillar. It is completely open to the outside. The wood plating over the boot arch and on the windscreen pillars, brings to mind the way surfboard manufacturers customise their boards. The cheerful wheel pattern resembles the floral pattern of wetsuits. The logo, visible on the boot arch, may be perceived as a signature for what could be a “Freestyle” collection by CITROËN. The beach, sand, salt and water are all considered as incompatible with cars. However, the CACTUS M was designed for this environment, to let users enjoy an intense, uncompromising leisure experience. The choice of shapes, materials, technologies and colours was guided by a desire to enable users to pursue the leisure experience inside the car while freeing them from all practical concerns. The overall design of the cabin resembles the hull of a boat. The flowing lines are a continuation of the exterior design. 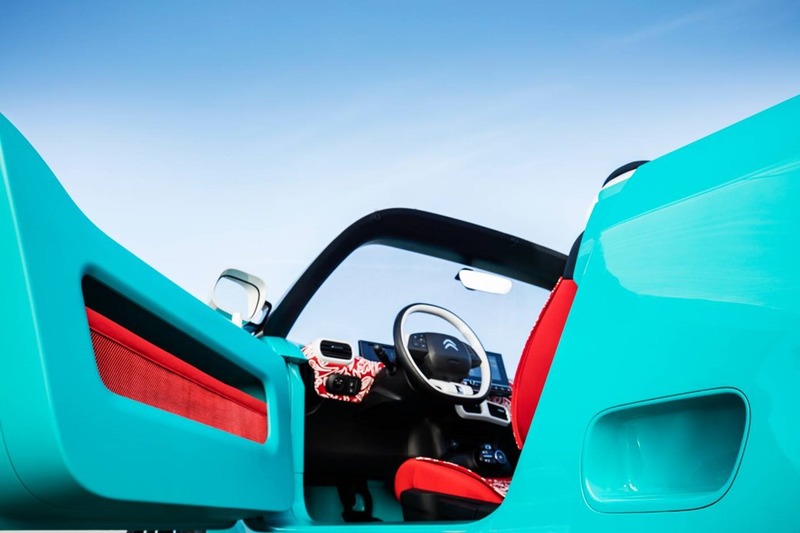 This impression of an object moulded in a single piece is emphasised by the use of the same colour — Jaws blue — for both the bodywork and cabin. A bright, optimistic colour, it points to the cheery character of this concept and encourages users to head for the open road. Looking beyond appearance, the functional qualities of a boat hull are also reflected in the overall design. The CITROËN CACTUS M is the ideal partner for all expeditions. All materials were selected or treated for their ability to adapt or resist. With the perforated foot wells and the seats in salt-resistant fabric designed to drain off water, occupants can get into the car without even drying or rinsing themselves. The whole cabin can even be hosed out. The CACTUS M has an attractive, functional interior. The upholstery and dashboard trim were designed to resemble wetsuits. The brightly coloured neoprene fabric adds warmth to the cabin and underlines the vehicle’s “alive” side. It also increases the waterproof qualities of the seats and reduces the time required for them to dry. The CITROËN CACTUS M concept is also practical: the rear sides are hollowed out to enable passengers to get into the seats in row 2 by stepping over the waist line. This solution makes for easier access while also creating a sense of freedom for passengers in the rear who do not need to open the door or fold the driver’s backrest. Inside the vehicle, a range of functional stowage compartments are available. The front doors have large bins closed by a net. The boot is accessed from the outside and two surfboards can be attached to the roof using specific lashing systems. To mark this event, CITROËN’s styling teams created two surfboards in the colours of the concept car. The character and strong personality of the CACTUS M concept car are inspired by the1968 Méhari and the seaside world associated with this legendary model. A number of styling features, such as the door opening straps and single central windscreen wiper bring to mind this design. 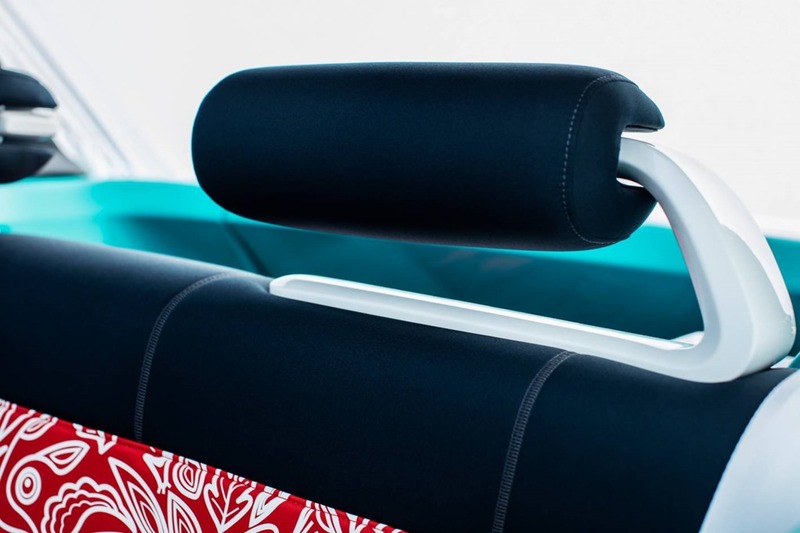 At the same time, the headrests are designed to resemble boat fenders, bringing to mind the marine environment associated with open-air vehicles. Designed for people looking for wide open spaces, the CACTUS M concept is the ideal partner for an adventure. Through its technologies and innovations, it overcomes any obstacles to exploration relating to the weather, logistics or bumpy terrain. The CITROËN CACTUS M combines Grip Control with Tall & Narrow tyres. This makes it more agile, enabling it to cope with the toughest terrain and gradients. Grip control adapts to all situations to optimise traction in any circumstances. 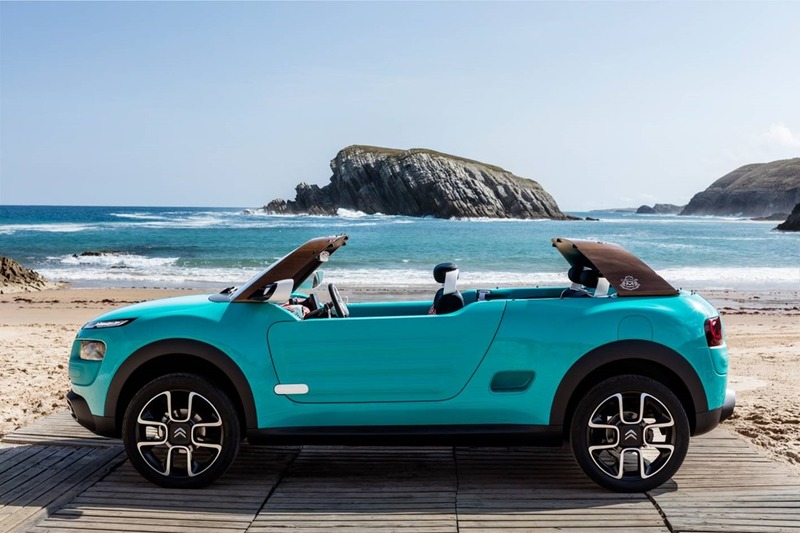 The CACTUS M concept was designed as an open-air vehicle but is able to adapt to any type of weather with its innovative top. Located in the double boot floor, this top can be installed by hand and stretched around the vehicle using an innovation inflation system. An air flow air inflates three tubes that hold the top in the correct position. The air is activated by a compressor at the rear of the vehicle. 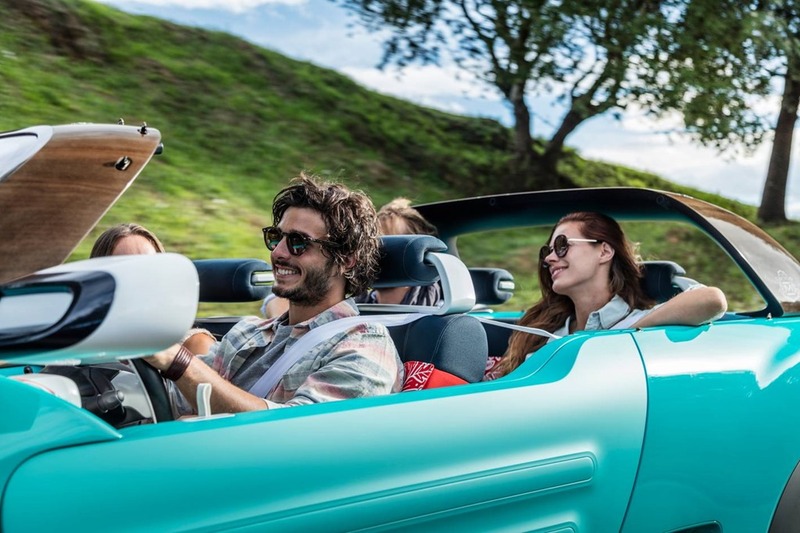 With its modular interior and this innovative top, the CITROËN CACTUS M overcomes logistics issues to leave more room for improvisation and freedom. For example, the CACTUS M can be turned into a bivouac for two people, making it possible to extend the outdoor experience. By means of an ingenious tilting mechanism, the rear seat becomes an extension of the boot, which opens downwards to create a couchette for two people. Users can either sleep in the open or under cover, using the inflation function to turn the top into a freestanding tent. This tent folds out at the rear of the vehicle, enabling two people measuring 1.80m in height to stand upright. No more limits stand in the way of the quest for discovery. For the top and the tent, CITROËN has worked with the two companies very famous of the sector. For the structure and safety of the tent, the brand called upon ATIC, an expert in inflatable structures for extreme conditions. To make the fabric, it worked with Jonathan & Fletcher, an expert in technical textiles for extreme sports. Looking beyond its innovations, the CITROËN CACTUS M is also enjoyable to drive every day since it has all the driving comfort and technologies present on the production C4 Cactus. One year on from the launch of the production model, this concept car illustrates the potential of the C4 Cactus as the basis for new models, as well as the extraordinary possibilities for deploying brand positioning through different body styles.